The study of medicine has had its ups an downs. The original practitioners learned to use herbs in various ways by trial and error to alleviate or even cure a lot of ills. Instead of getting a better business seal of approval, competent practitioners often found themselves facing charges of witchcraft. 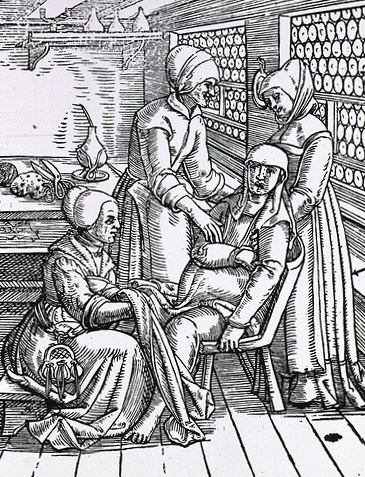 Over time, these mostly female midwives and herbalists were supplanted by men of science who called themselves “physicians” and dismissed everything these “unscientific” practitioners did and ‘reinvented the wheel’ with their own version of trial and error. You never read about doctors being burnt at the stake or tied to a chair and tossed in a lake to see if they float. Even worse, they invented hospitals, where they gathered together all manner of sick people. Since they had no idea of the existence of germs or bacteria, a trip to the hospital was quite often a death sentence. This didn’t begin to improve until the medical profession twigged to this and began practicing a little hygiene. In the 1800’s the only imaginable treatments for Tuberculosis were rest and pain killers. For those that could afford it, a remote TB Sanatorium was the place to go “for a cure”. In the absence if antibiotics (which had not been discovered by medicine at this time) this was actually a reasonably successful treatment. Isolation prevented the sufferers spreading the virulent illness further among the general population, with an added bonus of isolation protecting them from exposure to all the other ailments making the rounds. I have to wonder, though, if those wise women of the woods might not have gotten to antibiotics much earlier than the the men of science. They may have already been adding a pinch of mold to the eye of newt chamomile tea centuries ago. Once society decided to allow surgeons to actually study human anatomy, surgical techniques have improved enormously. And finally the medical community is beginning to lighten up, and allow practitioners of alternative medicine and midwives to help those that want them. Interestingly, the largest advances in patient treatment has been in the realm of pharmacology. Vitamins. Antibiotics. Vaccines. Medicine. As the men of science re-discover the actual effective properties of those ancient herbs, treatments once dispensed by the wise women, today’s men of science lock them up under patents, rendering them unaffordable to many and preventing researchers from building on the works of others in the search for better cures.